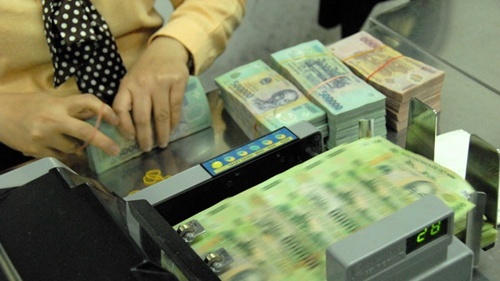 HCM CITY (VNS)— The State Bank of Viet Nam yesterday lowered the interest rate cap on bank deposits of up to six months by 1 percentage point to 6 per cent as part of efforts to boost credit growth. It cut policy interest rates by 0.5 percentage points, and the refinancing rate now stands at 6.5 per cent, the discount rate at 4.5 per cent, and the overnight rate at 7.5 per cent. "The cut is supported by factors including inflation being controlled (less than 6 per cent in February) and loan demand from both enterprises and individuals remaining modest," HSBC Viet Nam's deputy general director, Pham Hong Hai, said. "Mobilisation by commercial banks might reduce but there will be no significant changes," he said, though admitting that investors might now consider other asset classes. There is little possibility that banks would compete to get deposits by flouting the rate cap because liquidity is abundant, according to Hai, adding it would have no impact on foreign exchange rates either. The rate cap for US dollar deposits also went down by 0.25 per cent. Nguyen Hung, general director of TPBank, too believed the cut would have no impact on deposits, saying banks were already offering low interest rates on short-term deposits. Meanwhile, many people have changed their investing habit to deposit for longer terms to enjoy higher interest rates, he added. Le Quang Trung, deputy general director of the Viet Nam International Bank (VIB), said credit growth would benefit from the cut and the growth target of 12-14 per cent for this year is now feasible. The Bank for Investment and Development of Viet Nam (BIDV) yesterday announced deposit rates of 5 per cent for one month for individuals, and 5.5, 6.0, 6.5, and 7.5 per cent for two, three-five, six-to-11, and 12 months and above respectively. The short-term lending rate may be fixed at a maximum of 8 per cent, with seven – to 12-month terms carrying a rate as low as 5.5 per cent, the bank said. Tuoi tre (Youth) newspaper quoted Nguyen Son of the Institute of World Economics and Politics at the Viet Nam Academy of Social Sciences as saying interest-rate cuts are not enough to boost the economy. "The cut will encourage cash flow into business operations only if the economy is well restructured," he said. If other solutions to stimulate economic development were not implemented effectively, the cash would find its ways into gold, property, and securities, which could create a bubble, he said. He called for focusing on restructure of the State-owned enterprises and allowing real-estate companies to go bankrupt if needed. He also suggested measures like tax cuts to boost consumption since taxes make up 26-27 per cent of the GDP against around 20 per cent on average for developing countries. "The interest rate issue is no longer a matter of concern for enterprises, the focus is now on [market] demand," LienVietPostBank Vice Chairman Nguyen Duc Huong informed the Voice of Viet Nam (VOV). He suggested that public investments should be accelerated, and the stock market should offer more room to foreign investors in order to attract more capital for such investments.